The service we deliver to the residents, merchants, and visitors of Sonora are in keeping with the highest traditions of public safety. Safeguarding life and property is the Sonora Police Department’s highest priority and we pledge to carry out this obligation through compassion, dignity, and equality to every individual. Our actions will be distinguished by professionalism, fairness, and diligence. 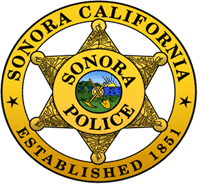 Click here to visit the City of Sonora Police Department website. The Sonora Police Department is a small but efficient law enforcement agency that is committed to serving the community’s needs with a high level of professionalism. We are comprised of a Chief of Police, a Lieutenant, two Sergeants, twelve sworn officers, one part time School Resource Officer, a Records Supervisor, five full-time Dispatch-Records Specialists, two part time Dispatch-Records Specialists and three part time Community Service Officers. These dedicated employees help ensure that our community and its visitors are safe and secure seven days a week, twenty-four hours a day. The Sonora Police Department embraces the Community Oriented Policing and Problem Solving (COPPS) philosophy as we partner with residents and business owners to identify the root causes of crime and disorder. Our goal is to make long-term improvements to the overall safety and quality of life of Sonora’s residential and visiting population through innovative thinking and the cooperative efforts of all stakeholders.